Aussie is hand cut from Silhouette paper on an original 19th century ledger page. 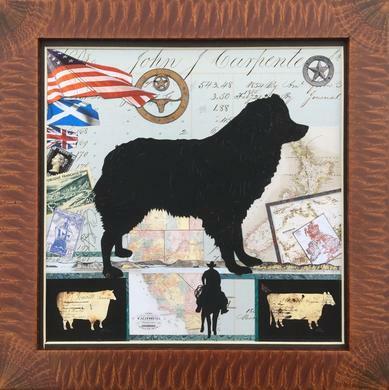 Hand cut cowboy and other images tell the history of the "make in America" Australian Shepherd. Archival materials, boards & glue used. Frame hand made in Ohio. Black frame available.